Self-consciously defining themselves as different and separate from their past, New Labour used the slogan 'Education, Education, Education' in its successful campaign in the UK General Election in 1997. Education went on to experience a highly centralised re-organisation of its values and standards that made Thatcher's Clause 28 look like parochial bigotry in its timidity. The unbelievable success story of year on year improvement in school exam results overseen by New Labour, with questionably giddy approval by Teachers' unions, would be enough to prompt the most sober of bystander to want to toast their achievements. Some years on, and the now Coalition government is now accused of politicising education. And by whom? Well, funnily enough it's the present chairwoman of Ofsted, Baroness Morgan of Huyton, whose 3 year contract the Education secretary Michael Gove has said he will not renew as he wants to freshen up Ofsted. It is worth noting at this point that it was Gove who appointed the Labour peer in the first place, is at pains to say she's done a great job and wants to re-employ her in another education role if he can. Baroness Morgan's replacement is reportedly thought to be Theodore Agnew, an insurance magnate who worked closely with Gove before the 2010 general election. Some of Gove's opponents are labeling the move as cronyism and part of a campaign to pack positions with Tory supporters before the next election, whilst the Education Secretary has insisted that he would make the appointment on merit and that it would be 'quite wrong' to rule out a suitable candidate simply because he was a Conservative. 'The decision to get rid of Sally Morgan had absolutely nothing to do with her abilities and everything to do with Michael Gove’s desire to get his own people on board.' A source close to Lib Dem Schools Minister David Laws said. So what are we to make of this recent spat - trust the political apparatchiks who say bad things about the Tories and trust them implicitly? After all, Baroness Morgan may have started out as a geography teacher but has been a loyal member of Labour Party since 1985, and has held several posts at Labour HQ, including director of campaigns. 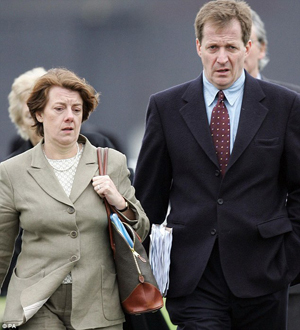 In 1997, she joined Tony Blair's office in Downing Street as political secretary, being was made a life peer in 2001. After a brief stint as Cabinet Office minister with responsibility for women she rejoined No 10 as director of government relations, leaving Downing Street in 2005. 'One of the really important things about public appointments is that they are made on the basis of merit and they are seen to be transparently made,' Lady Morgan said. 'I think there is something going on in the centre that's mitigating against that. I think there is an absolutely determined effort from No 10 that Conservative supporters will be appointed to public bodies. It has been a quiet, quiet drip. I'm not talking about Labour people being replaced, I'm talking about non-Conservative supporters being replaced by Conservative supporters. The moves comes amid tensions between Mr Gove and Ofsted - the Chief Inspector of Education, Sir Michael Wilshaw, was angered by media reports that there were plans to reform or even replace the organisation. So what is going on - is it a policy rift or in the absence of a proper discussion over policy, some empty politicking to retain jobs for yourself and you pals around the corridors of power? What has been relentless from Gove is the unashamed desire to raise standards and reverse the expectations of low standards or failure we've come to know and accept in state schools. Whether it be by introducing a more challenging curriculum, campaigns to have more discipline in schools, or have more self governed schools of the Academy or Free School format, Gove has presided over a very uncomfortable period in school education for teachers. There is a seriously anti-political message of snide remarks that people in politics organise around their interests as a bad thing being expressed here, and by the political opponents of Gove and the Coalition more generally. Obviously the Liberals are feeling the pressure as they are soon to face the electorate on their own and not part of the government so will be looking to position themselves as somehow worthy of being in government again. With no defining alternative to government policies, Labour find themselves in the invidious position of sniping at personalities and trying to embarass the Tories through innuendo. The education sector surely deserves better than replacing a discussion over content with a gutteral snipe over form, and I am convinced that society deserves better than the politics of teenagers jockying for position by embarassing their counterparts. You don't have to be a genius to realise that there is a serious problem in education when a 6 year old boy was suspended from school for having some mini cheddars in his lunchbox this week. These serious problems needs sorting out through an in depth discussion on what education is for and also at the level of policy, and the response to replacing Baroness Morgan shows that it's not forthcoming from the opposition at the moment.